I admit that I’m fickle when it comes to cookies. One of my favorite cookies in the world is a basic sugar cookie that my Mom taught me how to make when I was little, but I have trouble choosing a top five and sticking to it. I’ll forget about a favorite cookie after awhile, or a new cookie will come along and be my favorite thing for a few months until I discover something else. There were those Gingerbread White Chocolate Blondies that I fell pretty hard for, those Ganache-Stuffed Chocolate Chip Cookies that took me by surprise, the Lemon Wreath Cookies that I’ll be making every holiday season, and of course, the Homemade Thin Mint Cookies can’t be forgotten. And, there are probably twenty others that deserve a mention too. However, I can say with absolute certainty, this Irish Coffee Bar is currently, definitely one of my favorite cookies. They’re from the March issue of Living magazine. With a bar cookie, I usually prefer the middle pieces to the ones with crunchy edges, but as proof of just how good these were, I wanted to eat every bar from every region of the pan. The crunchy parts were great, the middles were great, the coffee flavor was aromatic and lovely, the sliced almonds on top added nice texture, and the whiskey glaze was sweet and ever so slightly boozy. They were also just as good after sitting for a couple of days as they were the day they were made. This is one of those delightful cookie recipes that doesn’t require a mixer. The dry ingredients including flour, baking powder, and baking soda were sifted and set aside. In a mixing bowl, melted butter, brown sugar, ground espresso, and salt were combined. Eggs and vanilla were whisked into the mix, and the dry ingredients were stirred in next. The batter was poured into a parchment-lined nine-inch by thirteen-inch pan, and it was topped with sliced almonds. It baked for about half an hour, and the pan was left to cool. The glaze was made with melted butter, some whiskey, and confectioners’ sugar. You could drizzle the glaze from a spoon, or place it in a bag and pipe it on the cooled bars. I opted to spoon the glaze into a plastic bag, snip the corner, and make diagonal lines of glaze. When the glaze had set, the cookie bars were cut. So, yes, I like a lot of cookies and sometimes get distracted and forget which ones I said were my favorites in the past, but these Irish Coffee Bars have captured my full attention. Now, I just need another excuse, or occasion, to bake these again soon. that looks so good, definitely bookmarking these! MMmmmm. These look quite yummy! This is so beautifully decorated, Lisa. In my new workplace they have a common room with a huge table in the center, where people can bring goodies to share with the whole department. That is absolutely great, because I love to bake cookies and sweet stuff, but don't care for consuming them that much. Boozy cookies? Sign me up, please. Gorgeous treats, Lisa. I bet these would accompany equally well a cup of black coffee or a pint of Guinness! Mmmm,perfect for an autumn afternoon! You have my undivided attention! My family prefers homemade cookies to almost any other dessert. 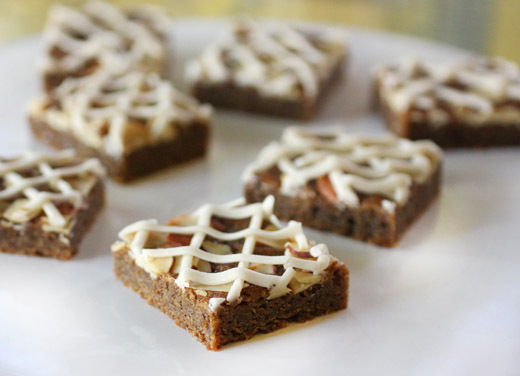 A charming fall treat that most certainly will become a holiday favorite! Wow, they sound amazing but I admire your piping skills as well. That lattice pattern on top is perfect. what a great idea! this is the first bar cookie of this nature that i've ever seen. marvelous finishing touches as well! This recipe is a keeper for the holidays. I love making bars instead of cookies. So much easier! This looks delicious! I don't know why I don't make bars more often. I have also fallen hard for cookies, so that's usually my go-to thing. But I think that needs rethinking, this looks fantastic! We had Irish coffee out with friends last night...one (or more!) of these would have tasted fantastic with it! I'm in awe of your photos...breathtaking! Really pretty! Great decorating job. And the recipe sounds nice, too. I could have these for breakfast - get my coffee fix that way! ;-) Good stuff - thanks. Sugar cookies are actually my favorite too! These look really great! Never had these before, but they look so good. The lattice is so pretty! I am sure these would be one of my favorite cookies too! 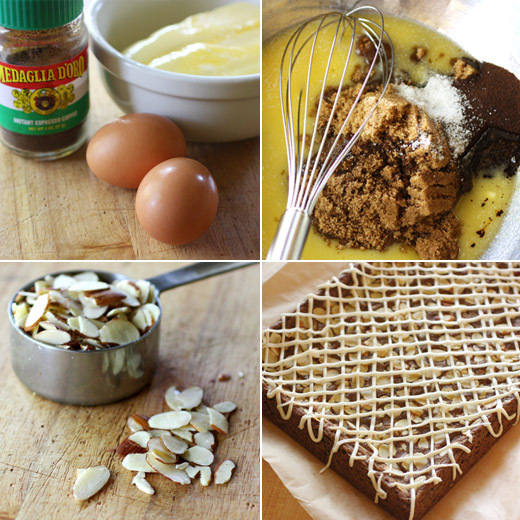 Almonds on top and that glaze sound and look wonderful! I love the flavor of coffee in baked goods. And these look so very pretty with the latticed glaze. 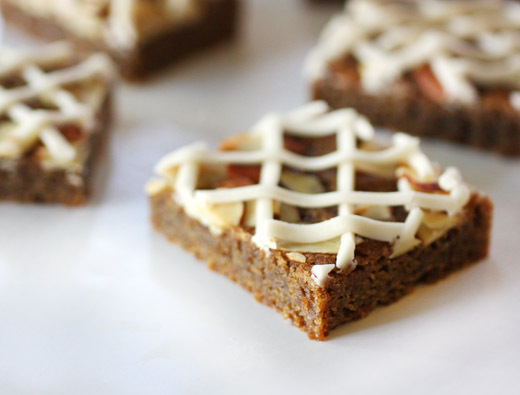 I just love the way you frosted these bars: so so elegant! I could see these at a fancy bridge and tea game, with the ladies who do that sort of thing!